An Australian one-hundred dollar banknote, top, and a New Zealand one-hundred dollar banknote. The New Zealand dollar has been knocking on the door of parity with the Australian dollar over Easter, touching just under 99.7c tonight. The kiwi closed at a post a new post-float high against the Australian dollar before the long weekend and as traders looked ahead to non-farm payrolls data in the US and what is expected to be an interest rate cut by the Reserve Bank of Australia after the long Easter weekend. The kiwi traded at 98.51 Australian cents on Thursday night, the closest it has come to parity since being allowed to trade freely in the 1984. The kiwi strengthened against the Australian dollar after figures showed Australia's trade deficit widened for a third month in February, to A$1.26 billion, just under-shooting a Bloomberg survey forecasting a gap of A$1.3 billion. Bloomberg data showed the kiwi at 99.61 Australian cents last night. The strong New Zealand currency is worrying exporters who send goods across the Tasman. Tourist here operators fear fewer Australians - this country's main source of tourists - will visit and more New Zealanders will be tempted to take their holidays across the Tasman. The New Zealand dollar strengthened against the United States dollar too, trading todlay at over 76c. كما عودتكم وتبعا لسياسة ومنهج نادي خبراء المال فيجب علينا توضيح مدى امتلاكنا لعقود بيع او شراء بالسهم او السلعة التي نوصي بها ..
Economists warn of downsides for New Zealanders returning home and for exporters facing financial losses. • The kiwi dollar peaked yesterday at 99.78c, nudging parity with the Australian. • We have never been so close to parity with our neighbour since our dollar was floated in 1985. • It's good news for Kiwi travellers. Your money will go further on holiday across the Ditch. But Kiwi exporters to Australia feel the pain. • The Reserve Bank of Australia meets today to try to resuscitate its flagging economy. Dropping interest rates could send the kiwi dollar higher, say experts. 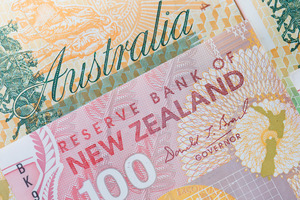 The Kiwi dollar could finally equal the Australian dollar in value today, with some saying it's just one more index of disparity to dissolve between the two countries. Bloomberg recorded the New Zealand dollar at A99.78c yesterday afternoon, the closest the currencies have been since our dollar was floated in 1985. All eyes will be on the Reserve Bank of Australia today as an interest rate announcement expected to cut the official rate even further to stimulate that country's economy could mean the Aussie dollar loses further ground against other currencies. New Zealand's economy is doing well out of Asian demand for agricultural products while Australia is struggling with the end of the global commodities boom as China's growth slows. We have never been so close to parity with our neighbour since our dollar was floated in 1985. Illustration / Rod EmmersonPsychologist Chris Skellet said it was promising to see "one more index of disparity dissolve between the two countries". "It's important that we assume equivalence between us rather than adopt a one up/one down perspective," he said. "No matter how Australians regard us, we need to adopt an unrelenting attitude of equality and respect towards our neighbours." Mr Skellet said the Cricket World Cup final was an example of a more mature attitude towards the age-old trans-Tasman rivalry. "We don't need to crow or brag about who we are, or feel humiliated if others crow at us. We are simply confident and proud of who we are, regardless of relativities across the Tasman. The exchange rate is only one index of economic health, but there will certainly be a feel-good factor when we regain parity at last." New Zealanders have already been making the most of the strong kiwi dollar, with visitor numbers reaching record highs, and that trend looks set to soar as the dollar is within reach of parity with the Australian currency. Migration statistics show 1.2 million Kiwis holidayed in Australia last year, and some flight companies have reported booking boosts of 25 per cent so far this year, with a 40 per cent increase to some states. While the tourism industry expected even more New Zealanders to travel to Australia, economists warned of downsides for Kiwis returning home and for exporters facing financial losses in the country's second largest export market. VideoInstitute of Economic Research principal economist Shamubeel Eaqub said the two biggest impacts of the potential parity would be for Kiwis holidaying in Australia and New Zealanders returning here from across the Ditch. "New Zealanders going to Australia to visit for a holiday ... things are going to be quite a bit cheaper," he said. "Theoretically it used to be for every A$1 you only got 80 cents, but now you are going to be getting, roughly speaking, 20 per cent more for your money." BNZ chief economist Tony Alexander said not only would trips across the Tasman be cheaper - but so too would goods and services while tourists are there. Tourism Australia managing director John O'Sullivan said the favourable exchange rate was a welcome boost, as it meant Kiwis had more Aussie dollars in their pockets to spend in Australia. 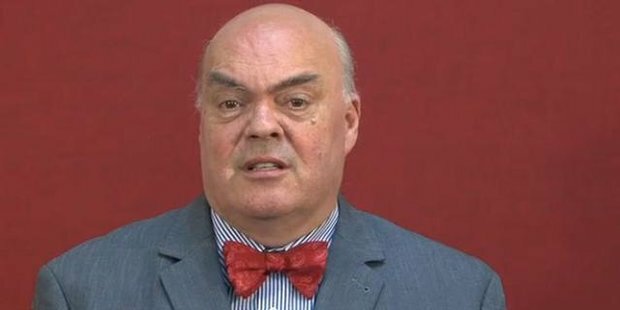 Mr Eaqub said New Zealanders returning from Australia would feel the pinch. "For those Kiwis coming back to New Zealand they're going to have less money when they transfer their savings and income across than they previously would." There would also be an adverse impact on exporters, who would have the absorb the price of the dollar shift, at least in the short term. Finance Minister Bill English said the strong New Zealand dollar would be tough for exporters sending their goods to Australia. "We expect it will have some impact but these are very resilient businesses," he said. "On the other hand a lot of New Zealanders will be pleased to find that their Kiwi dollar has got similar purchasing power to an Aussie dollar." 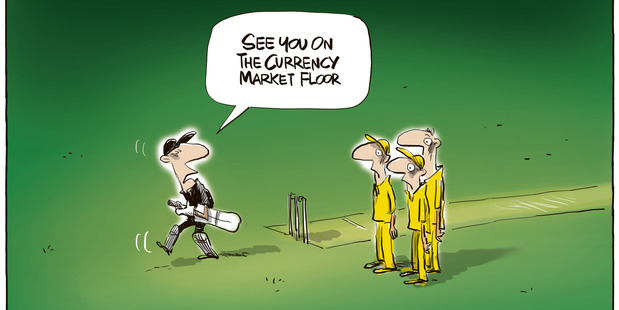 Despite the currency's rise, Mr Alexander warned against Kiwis claiming bragging rights for the feat. "I wouldn't think that's a very good idea because we just open it up to the Aussies saying, 'Cricket'. In the long term, they will outplay our economy. In the past two years, they have simply had a few chooks that have come home to roost."